I wanted to start out this program series with a bang. One that would bring in a lot of people so they would learn about all of the others coming up and one that would be a blast. Starting with slime was a no-brainer! I love come and go programs where caregivers can work with their kids at their own pace. 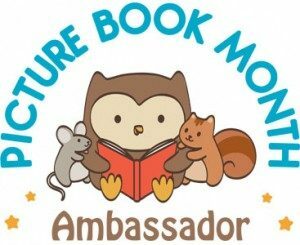 When interest starts to wane, they can go check out books or do other activities around the branch. 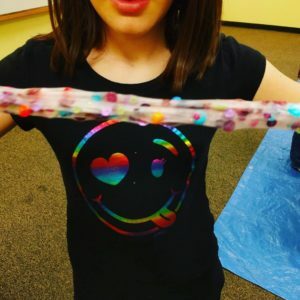 For Kids Create: Slime! I had a two different basic slime recipes they could try. 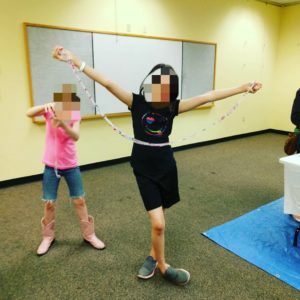 I had clear glue, colored clear glue with glitter, and plain white glue they could choose from. I also had washable paints that could be added to the glue to make different colors. I had a table of add-ins which was inspired by the Ontarian Librarian. 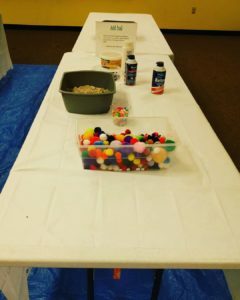 My add-ins included beads, pompoms, sand from my recent trip to the beach, large sequins, hand lotion, shaving cream, and air dry clay. 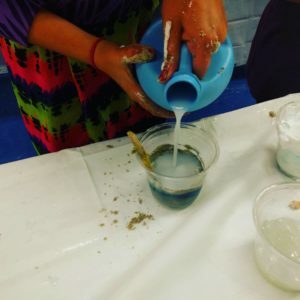 This is where kids got really creative and made some amazing concoctions! 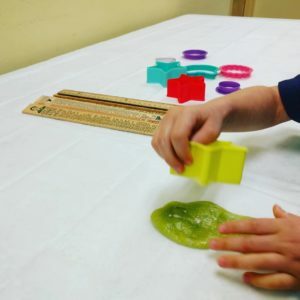 I also had a Play With It station with cookie cutters, a rolling pin, and rulers so they could measure how long they could stretch their slime. I made a tub of Oobleck that people could touch and see. Oobleck can be very messy! 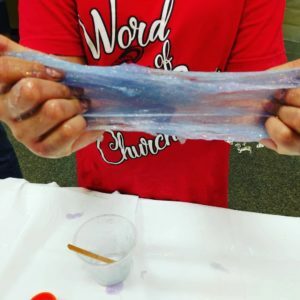 I highly recommend having a slime program! This is going to get messy so prepare yourself and your patrons. In my promotion materials I told them to come prepared to get slimed. I personally have a large tarp that I put down on the ground. Two rows of two 6-foot tables put together end to end fit on it. I knew people would be up moving around so I didn’t put out any chairs. My instructional signage and slime recipes are available here for download. Overall, it was a big success and a great way to kick of Kids Create. 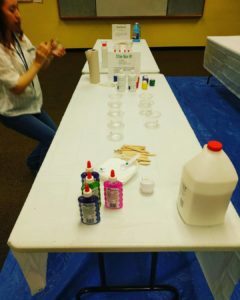 I am going to offer this program again in the winter but will stick with white glue, shaving cream, fake snow, and peppermint extract to make fluffy “snow slime”. It will most likely be the only way these Texas kids will get to see snow.